Since late 1988, the Public Affairs Research Council of Alabama has produced an analysis of Alabama’s tax revenues. Relying on the U.S. Census Bureau’s annual survey of state and local governments across the country, we are able to determine how Alabama taxes and revenue compare to other states. In the analysis, state and local spending are considered together, because states vary greatly in how they divide up the responsibilities for funding government services. This report considers data from 2015, the most recent year available. Alabama’s state and local governments collect less in taxes than state and local governments in any other state in the union. This has been a basic fact of life in this state since the early the 1990s. It lies at the root of our perpetual struggles to balance state budgets. It underlies the difficulties we face when trying to provide to our citizens the level of government services enjoyed by citizens in other states. As a bottom line, Alabama governments have less tax money available finance the operation of services like schools, roads, courts, health care, and public safety. 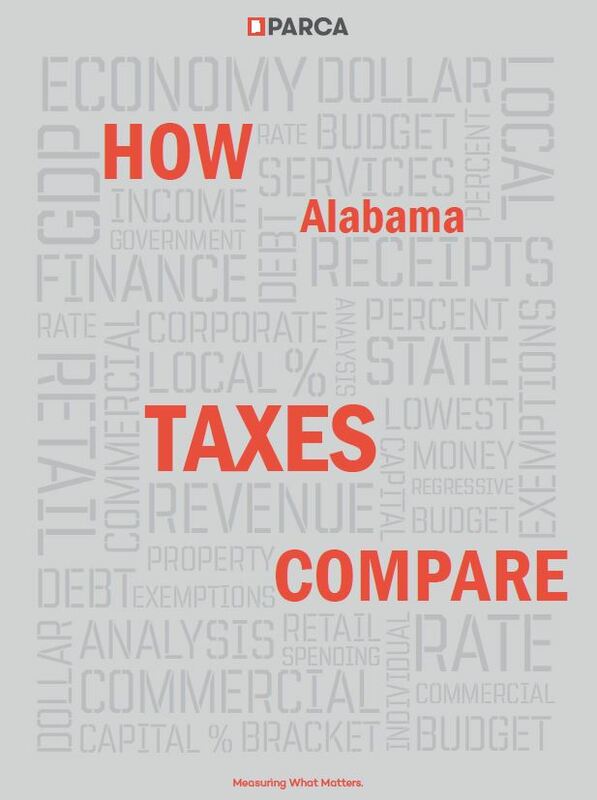 Explore our latest report, How Alabama Taxes Compare, and see how Alabama’s tax system fares against our southeastern neighbors, and what that means for our state. If you want to compare Alabama’s per capita taxes to those in other states, PARCA-designed interactive tables are available online. 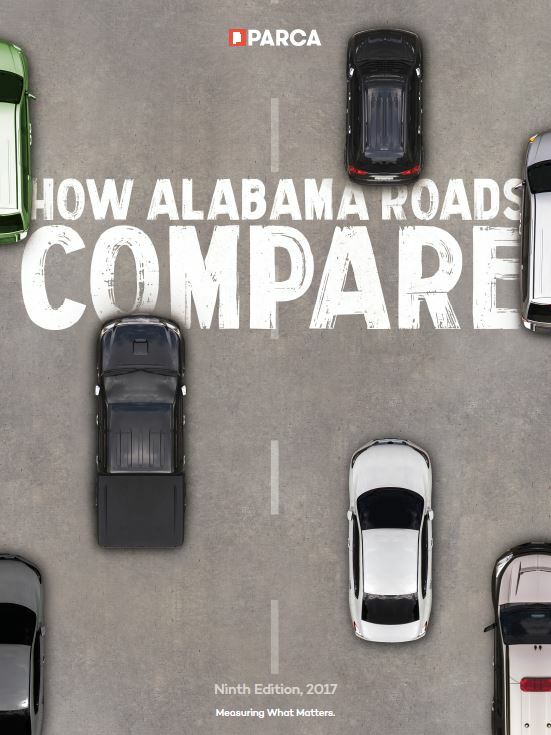 PARCA’s latest report, How Alabama Roads Compare, provides an in-depth analysis of the conditions, funding and future of our state’s roads and bridges. Data presented in the report can also be viewed through interactive tables here. Alabama Roads: Where are we now? Alabama’s roads and bridges are in relatively good condition compared to other Southeastern states. The percentage of roads in good condition is higher than most other states and the percentage of roads in poor condition is lower than most other states. The percentage of bridges in need of replacement because of deficiency is about average for the Southeast. However, those generally good conditions on existing roads have come at a cost. The Alabama Department of Transportation has had to devote an increasingly large share of its budget to preserving the existing road system, with a shrinking pool of money available for new projects to address congestion or expand the road system to foster transportation improvements and economic development. Currently, only $150 million per year is available for system enhancement and expansion projects, a drop in the bucket considering the billions of dollars in projects needed to address existing congestion issues, much less the additional billions that would be needed to finance aspirational projects like Birmingham’s Northern Beltline, a new Mobile River bridge, and variety of other projects desired by communities large and small. 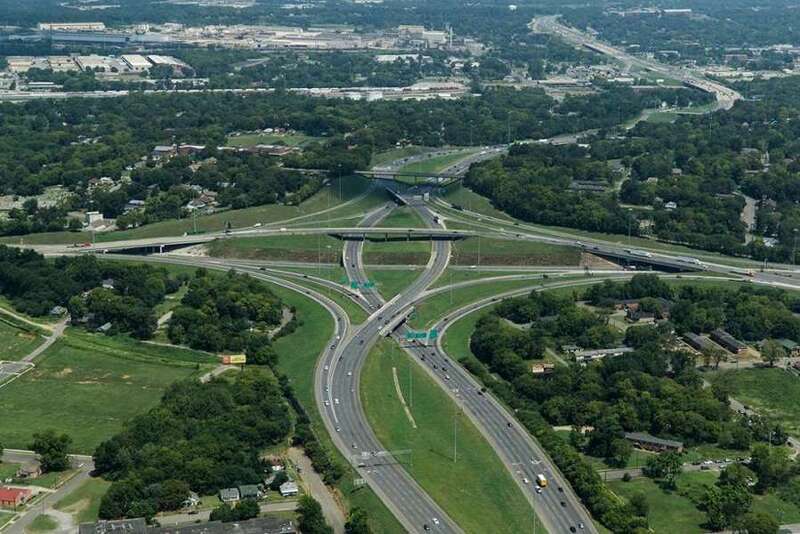 Alabama’s road spending in recent years has been supplemented by more than $1.3 billion in borrowing. That has allowed state and local governments to tackle needed improvements and perform in the present projects that will pay dividends in the future. However, that borrowing authority has been exhausted, and future road spending will be curtailed. The infusion of borrowed money is ending and the demands of paying back what has already been borrowed money will consume a greater share of road money. This impending road revenue crunch is rooted in a fundamental problem in how we pay for roads: a set 18-cents per gallon motor fuels tax. Per-gallon motor fuels taxes were last raised in the early 1990s. The buying power of that 18 cents on each gallon has eroded due to inflation. On top of that, the greater fuel economy of cars and trucks on the road today means that less gas in being purchased to fuel more miles of travel. 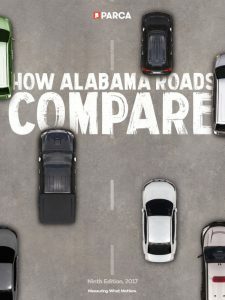 The wear and tear of traffic on the roads continues to increase, but revenue from per-gallon taxes is not keeping pace. Per vehicle mile traveled, Alabama is collecting half what it did in the early 1990s, when adjusted for inflation. In the immediate term, the 2018 transportation budget will contain about $200 million less in revenue than it has enjoyed for the past 5 years, revenue provided through the ATRIP borrowing program. The debt service required to pay that borrowing back has been steadily climbing. In 2018, it will leap to $114 million, almost $50 million more than the 2017 total, and remain locked in for the next 19 years. As a bottom line, in 2018, there will be about $250 million less to spend on roads than there was in 2017. Alabama needs sufficient revenue to pay for the upkeep of its current system, plus an adequate pool of money available to add capacity to address congestion problems and to improve the transportation network. That revenue for roads also needs to cover the cost of paying back the money the state has already borrowed. Alabama hasn’t raised its per gallon gas tax in 25 years. Only 8 other states have gone as long without an increase. 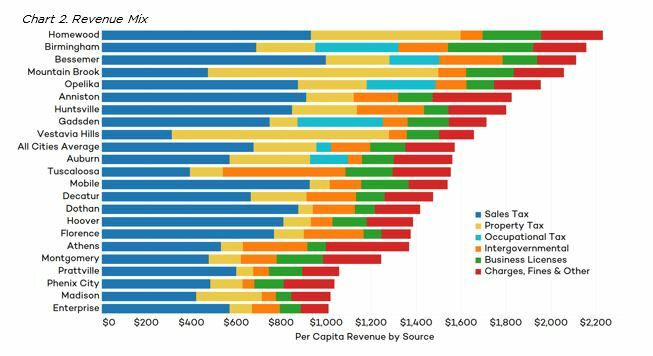 In recent years, most states have raised per gallon taxes and have also adopted mechanisms to address the drain on buying power created by inflation and greater fuel economy. 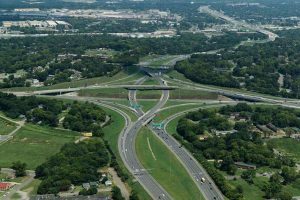 In the past several legislative sessions, Alabama lawmakers have introduced various proposals to address the impending shortfall in road funding but none of those proposals have gathered sufficient support. As those proposals resurface in subsequent sessions, attention should be paid not only to preventing the immediate shortfall but to preventing the perpetual erosion of road dollars. Many of our Southeastern neighbors have crafted long-term approaches to road funding from which Alabama could learn. Click here to read the full report, including information on traffic vs. capacity, construction and maintenance, road debt and more. In June 2017, the Alabama State Board of Education voted to cancel its contract with ACT for the administration of the ACT Aspire, a suite of standardized tests which, for the past four years, has served as the primary assessment tool Alabama used to gauge the annual academic progress of public school students across the state. Identifying the best replacement for Aspire is crucial. It’s a decision that affects everyone who cares about the quality of public education, from students, teachers, and parents to the leaders of government, education, and business. PARCA’s latest report, Student Achievement Matters: The Future of Student Assessment Is Now, lays out the recent history of assessments, what state and national assessments tell us about the performance of Alabama students, and calls attention to the steps we should take from here. It is vital that Alabama have an honest, rigorous, enduring test if students, parents, teachers, education leaders, and the state as a whole are going to have a realistic picture of Alabama’s educational system and an effective tool for gauging progress. 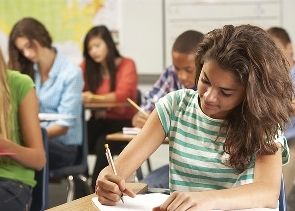 An annual assessment of student achievement is required by federal law. State education leaders have indicated they will use an assessment provided by a different testing company, Scantron, in 2018. Meanwhile, a process for determining a long-term replacement has begun. These decisions on the future of Alabama’s statewide assessments are critical. These assessments are a cornerstone of the state’s education accountability system. They are required by federal law. The assessments should tell us how students, schools, and systems are performing regarding state standards and in comparison to other peers, both in Alabama and in the nation at large. The new report, commissioned by the Business Education Alliance and prepared with policy expertise from A+ Education Partnership, describes what the state should be looking for in a new assessment system and the process that should be in place for its selection. A comprehensive system of high-quality student assessments should be an efficient system and produce the necessary information with the least amount of assessment. Student assessments are used to make vital decisions about instruction, interventions and support, advanced educational opportunities, and policies. High-quality, standardized student assessments are essential for evaluating equity among schools and within them. Most importantly, assessments should be a tool for the growth of individual students, a true measure of strengths and weakness, and a real-world appraisal of a student’s position on the path to college and career readiness. In the globally competitive, technologically advanced economy of the 21st century, it is imperative that our graduates receive an education equal in quality to that received by students in other states. That is the only way our graduates can succeed, and our state can attract employers looking for qualified employees. The decisions that will have to be made on the future of assessments in Alabama must be made with broad engagement and buy-in from the educational community, its citizenry, and the state’s political and business leadership. Student achievement matters to us all. 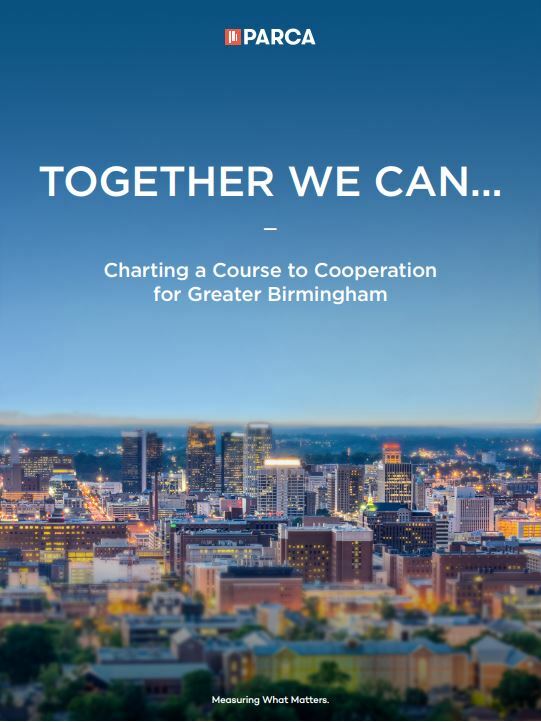 PARCA’s latest report, commissioned by the Community Foundation of Greater Birmingham, focuses on the fragmentation of the Birmingham region, the challenges it causes, and potential solutions exemplified by other metro areas around the country. With the clouds of Jefferson County’s bankruptcy lifting and downtown Birmingham showing impressive signs of revival, optimism about the region’s future is high. Considering the positive signs, it’s important to ask whether the community is prepared and positioned to capitalize on its current momentum. 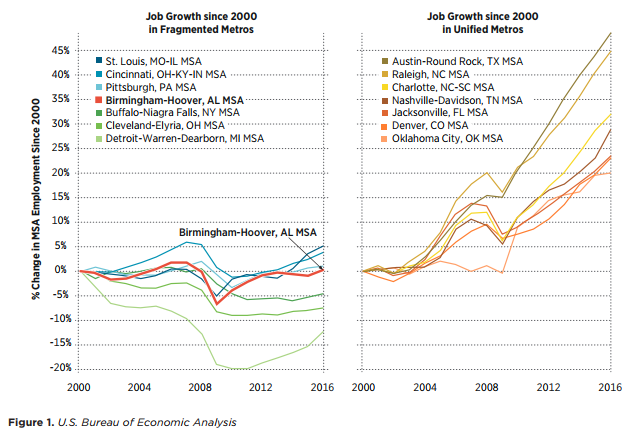 The region’s central city of Birmingham is surrounded by more independent suburbs than any other southern city. This pattern of fragmentation has consequences. It leads to duplication, creates intra-regional competition, concentrates economic advantage and disadvantage, and diffuses resources and leadership. It makes it difficult to arrive at consensus, pursue priorities of regional importance, or deliver services that transcend municipal boundaries. In sum, it puts the metro area at a disadvantage. The negative effects of fragmentation weigh not only on the center city but also on the metropolitan area as a whole. The fortunes of the central city and its suburbs are interlocked. This is not a new issue for the region, and greater Birmingham is not alone in having tried multiple times to resolve it. With the negative effects of fragmentation having become very clear, it is time for fresh ideas and new conversation about how Greater Birmingham can chart a new, more prosperous course. The public seems ready to engage in this conversation. View the full report here and access additional components of the project here. 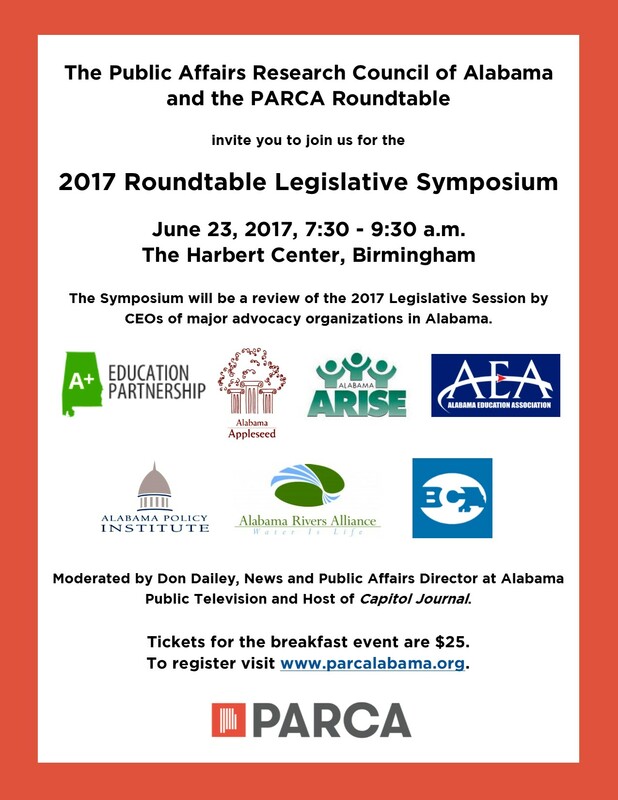 The Public Affairs Research Council of Alabama and the PARCA Roundtable will be hosting the PARCA Roundtable Legislative Symposium on June 23, 2017 from 7:30 – 9:30 a.m. at The Harbert Center in downtown Birmingham. The panel will be moderated by Don Dailey, News and Public Affairs Director at Alabama Public Television and Host of Capitol Journal. Tickets for the breakfast event are $25. Register here today! How Alabama City Finances Compare is the ninth edition of PARCA’s study of Alabama city finances. This report provides basic information on municipal revenues, expenditures, and general fund balances from the most recent year available. The comparisons are in per capita amounts (dollars divided by resident population) so that cities of differing populations can be compared with one another. This edition of the report includes data on 22 cities, generally those having a population over 20,000. The information provided can be valuable for city officials to use in benchmarking with their peers and for citizens to see how their municipality ranks financially among comparable cities within the state. 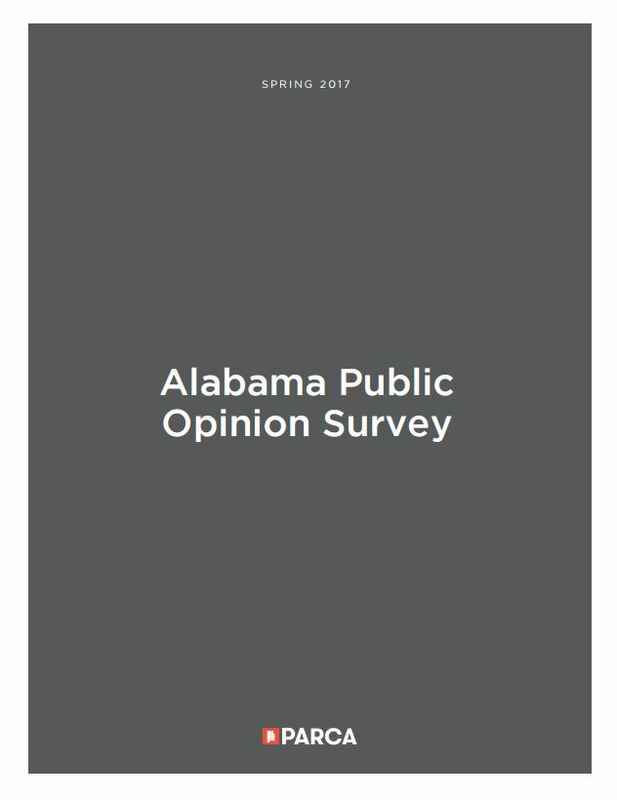 In conjunction with the report on city finances, PARCA is also releasing the Municipal Executives Opinion Survey, a survey of 127 mayors and city executives from across Alabama. Responses indicate that these city leaders are generally optimistic about economic conditions and the stability of revenue sources in the coming year, although many expect increased HR costs, as well. Despite the optimism, executives face challenges, too. There appear to be substantial demands for infrastructure improvements without a letup in expectations regarding public safety, human services, or government operations. Priorities for the coming year emphasize economic development and jobs, education, and building or repairing roads, sidewalks, and parks. Just over 60 percent of Alabama’s 2016 high school graduates scored “workforce ready” in 2016, according to new results from ACT’s WorkKeys assessment. The Class of 2016’s success rate, 61.3 percent, improves on the 60.8 percent rate for the Class of 2015. And because a greater number of students took the test in 2016, the Class of 2016 produced more workforce ready graduates: 28,717 compared to 2015’s total of 25,453, netting an increase of 3,264 graduates earning Silver level or above workforce credentials. This is the second year that all high school seniors were offered the WorkKeys assessment, a battery of tests designed to determine whether students can demonstrate the skills they’ll need to enter the workforce. ACT WorkKeys assessments have been used for more than two decades by job seekers, employees, employers, students, educators, administrators, and workforce and economic developers. The assessments are designed to measure both cognitive (“hard”) and noncognitive (“soft”) skills tests. Alabama students take the Applied Mathematics, Reading for Information, and Locating Information tests. Based on the scores attained on the three assessments, students may be eligible to earn a Bronze, Silver, Gold, or Platinum Certificate. Statewide, 61.3 percent of high school graduates earned a Silver level WorkKeys certificate or higher; 47 percent reached the Silver level and 15 percent earned a Gold certificate. Less than 1 percent earned a Platinum Level Certificate. Of the students tested, 23 percent earned a bronze level certification and 16 percent didn’t score high enough to obtain a credential. The WorkKeys test was developed by ACT, the same company that offers the ACT, the widely-known test of college readiness. When comparing school system performance on WorkKeys to results from the ACT, there are some differences in performance. For instance, the top scoring system on WorkKeys was Arab City, where 91 percent of graduates scored Silver or above. Arab ranked 10th in the state on the ACT in the percentage of students who met all benchmarks for college readiness (30 percent). Hartselle City ranked third in the state in the percentage of students scoring Silver or above (86 percent) on WorkKeys, but ranked 7th on ACT performance (33 percent of students meeting all college-ready benchmarks). Homewood City Schools was third in the state in the percentage of students earning all college-ready benchmarks on the ACT (46 percent) but was 14th on WorkKeys success (79 percent). The content of the test was developed using a similar approach to the ACT. ACT surveyed employers to develop a catalog of the foundational skills needed to succeed in the workplace, across industries and occupations. ACT then developed a test to measure whether prospective employees or, in this case, high school students, had those necessary skills to perform in the nearly 20,000 occupations ACT evaluated. The results can be provided to employers to demonstrate that a job applicant has the skills needed for workplace success. Using the results, students should be able to determine their skill levels, identify skills needing improvement, and match the measured skill levels to specific job requirements. Additional information for understanding WorkKey’s scores can be found on ACT’s website, including this guide to understanding your scores. The latest report by PARCA was released last week at the Business Council of Alabama’s 2016 Governmental Affairs Conference. The report, entitled “Exceeding Expectations: Keys to Alabama’s Student Success,” the third PARCA research report commissioned by the Business Education Alliance of Alabama (BEA). Exceeding Expectations examines the progress state schools have made toward goals established under the state’s strategic plan for improving education, Plan 2020. While noting the gains in the state’s high school graduation rate, the report also points to the need to improve the college and career readiness of graduates. By spotlighting school systems that have been the most successful in performance and improvement, the report attempts to describe common approaches and practices that can be emulated by other school systems. Using a variety of metrics, PARCA identified systems that consistently perform at the highest level (Mountain Brook, Vestavia Hills, Madison City, and Homewood City); systems that were the most improved in reading (Muscle Shoals City) and math (Opp City Schools); and systems that significantly outperformed expectations considering the socioeconomic backgrounds of the students they serve (Oxford City and Pike County). The report found that all of the high-performing systems not only adopted the Alabama’s new College and Career Ready Standards, they also invested significant time and effort into translating the standards for application to the classroom. These systems prioritize professional development for teachers, building time into the school day for teachers to plan, analyze data, and collaborate on improving their teaching. They have created systems for supporting teachers through coaching and mentoring for first-year teachers. These systems have challenged teachers to move from a lecture-driven, teacher-centered classroom toward an environment in which students take ownership of learning. The report also describes Selma City System’s approach to providing Pre-K for its students and Blount County’s focus on improving the quality and quantity of career and technical education offerings. “Alabama school systems have been challenged like never before by the aspirational goals of Plan 2020; however, we know we can accomplish the goals it outlines – we must,” said Joe Morton, Ph.D., BEA chairman and president, in presenting the report. Last month, PARCA won a national award from the Governmental Research Association for its two previous reports for the BEA, Obstacles into Opportunities published in 2014, and Teachers Matter published in 2015. PARCA’s research and analysis have helped provide an objective foundation and policy framework for increased investment in key initiatives such as the expansion of the state’s First Class public Pre-K program, for investments in teacher quality, and for more rigorous and thorough assessments of Alabama students’ academic performance. PARCA’s research reports on education funding, Alabama’s education performance, and plans for its improvement received national recognition by the Governmental Research Association (GRA) at the GRA’s annual conference in Pittsburgh last week. PARCA received the GRA award for “Outstanding Policy Achievement” on a state government issue for its ongoing work to evaluate the progress of the Alabama’s strategic plan for improving education, Plan 2020. The award was given based on several criteria, including the display of tangible improvements in public policy and/or cost savings resulting from the research and recommendations of a governmental research agency. PARCA’s research and analysis has helped provide an objective foundation and policy framework for increased investment in key initiatives such as the expansion of the state’s First Class public Pre-K program, for investments in teacher quality, and for more rigorous and thorough assessments of Alabama students’ academic performance. The award included recognition for three pieces of PARCA’s education research. The first piece was a survey of public opinion published in January 2016 which revealed that Alabama citizens were willing to pay more for education funding. The award also recognized two studies published on Alabama’s education system. Both reports were commissioned and funded by the Business Education Alliance of Alabama. 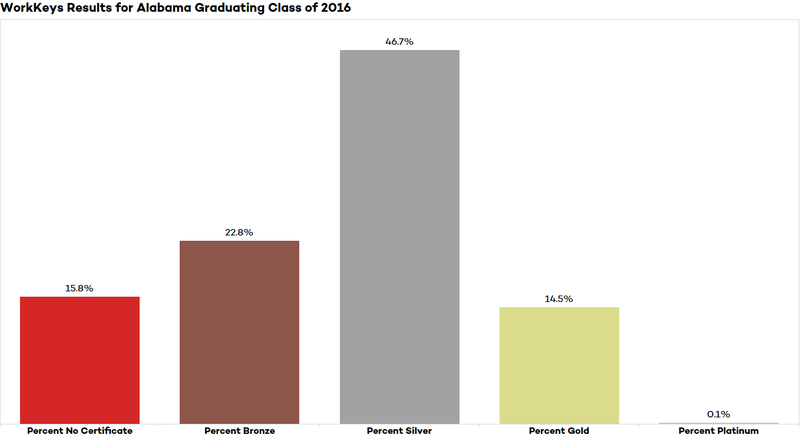 Obstacles into Opportunities was published in 2014 and details the steps PARCA identified as necessary for Alabama to meet its goal of a 90% high school graduation rate by 2020, having those graduates prepared for the modern economy. The second report, Teachers Matter, was published in 2015. It examines how to create and retain high quality teachers. PARCA’s retired executive director Jim Williams was also honored at the GRA annual conference. He received the 2016 Frederick P. Gruenberg Award. The Gruenberg Award is the highest distinction that the GRA can bestow on individuals who have made outstanding contributions to the field of governmental research during their careers. Jim’s work over the course of his 27-years at PARCA had a substantial impact on Alabama’s governmental practices and policy.